You’ve reached the virtual home of WHERE IS JACK? 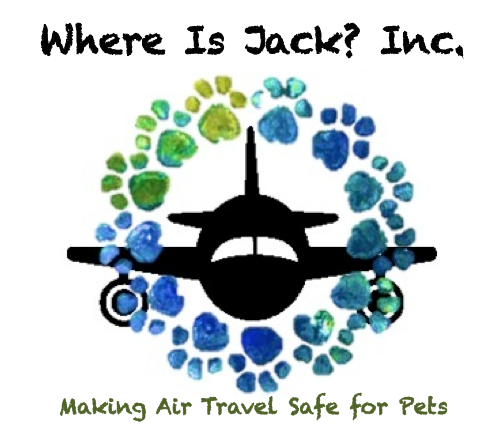 INC. – the premier resource for information about FLYING SAFELY with a pet! Every day, pets are LOST, INJURED and KILLED while engaging in air travel – between the moment they are checked in at the ticket counter, through the TSA screening, to the flight itself… and even while de-planing and as they are returned to their pet parents!! We are here to provide YOU – the pet guardian – with THE INFORMATION YOU NEED TO KEEP YOUR PET SAFE WHEN YOU ENGAGE IN AIR TRAVEL TOGETHER. We’ve placed a link to our downloadable PET AIR SAFETY CHECKLIST at the right on each page… and at the top of this page you will find links to pages that will guide you through every part of the air travel experience with your pet. And check out our BLOG (also listed at right) – where we occasionally muse on current events and developments in pet air travel and on what we’re doing NOW to help make it safer and more humane. We are here to help YOU keep your pet safe when you travel… it’s all we care about. Because we’ve been there. And we don’t want you and your fur-kid to go through what we had to go through. Be sure to contact us with your questions, and with your experiences about flying with your pet! !